In this essay we will try to define what the venture capital is and how it is related to the risk concept. 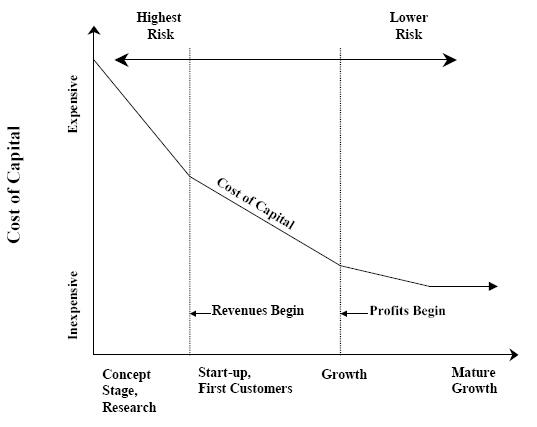 Generally speaking, the financial risk posed by a business venture corresponds with its stage of development, as shown in the following figure. Certainly there are mature businesses that are struggling and may present a high level of risk, but the following figure summarizes the risk spectrum as it applies to most businesses. The highest risk level for a business is at its earliest stages (the left side of the figure) before it has begun to generate much revenue. As businesses begin to sell products or services, expand, achieve breakeven cash flow and profitability, the level of risk of an investment in that business drops, moving to the right of the figure. 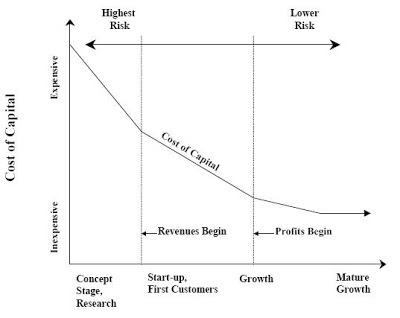 As the risk declines, the cost of raising capital for the business declines also, as shown by the figure. The cost of raising capital is the price the business must pay to get the capital it needs. It pays that price either in the form of a share of ownership in the business or through payments of interest, dividends, royalties, or other payments. Raising capital also gets easier as the risk level declines, especially once the business progresses to the point that banks become interested in lending it money. Given a choice, entrepreneurs looking for money for their business will try to raise that capital at the lowest cost possible. Usually, the least cost option for a business is a loan from a bank or other commercial lender. These lenders look for an annual return that is typically in the range of about 5% to 12%, varying with changes in the Prime Rate of interest. Venture investors, on the other hand, look for annualized returns more in the range of 25% and up. So entrepreneurs looking for money will usually look for venture capital only if they do not have the choice of lower cost capital. Banks and other lenders can offer comparatively low rates because they lend to companies that have a low risk of default on their loans. Companies that present a low risk of default would be placed on the right side of the figure. Some entrepreneurs complain that banks will only lend to businesses that do not need the money. The truth is that banks earn a comparatively small profit on the funds they lend; therefore, they cannot afford to make many bad loans. One bad loan may cost a bank more than the profit it makes on 25 good loans. Banks strive to keep their losses on bad loans to significantly less than 1% of their portfolios, so they lend to businesses that demonstrate the ability to repay the loan. Also, banks are looking for current income, and expect payments of interest, and usually principal as well, on a monthly basis. While no amount of money will make a bad business successful, no business can survive without enough money to develop products, hire employees, establish markets and attract customers. For many businesses, particularly in the early stages before profits become predictable, traditional sources of capital such as banks and credit unions are simply unavailable due to the reasons depicted in the above paragraphs. For those businesses, venture capital may be the best hope to raise the money needed to succeed. Venture capital investing is all about a willingness to accept a high degree of risk in order to obtain the potential for an extremely high rate of return. Venture capital investing is also about a desire to build a small company into a large one, to build a company that no one has ever heard of into a company that makes headlines. Venture capital is a type of private equity capital typically provided to early-stage, high-potential, growth companies in the interest of generating a return through an eventual realization event such as an IPO or trade sale of the company. 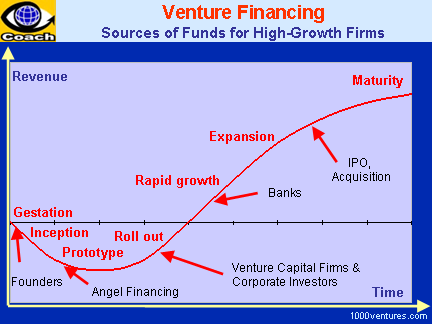 Venture capital investments are generally made as cash in exchange for shares in the invested company. A venture capitalist is a person or investment firm that makes venture investments and these venture capitalists are expected to bring managerial and technical expertise as well as capital to their investments. A venture capital fund refers to a pooled investment vehicle that primarily invests the financial capital of third-party investors in enterprises that are too risky for the standard capital markets or bank loans. Venture Capital or in other words Private Equity provides long-term, committed share capital, to help unquoted companies to grow and succeed. Obtaining private equity is very different from raising debtor a loan from a lender, such as a bank. Lenders, who usually seek security such as a charge over the assets of the company, will charge interest on a loan and seek repayment of the capital. Private equity is invested in exchange for a stake in the company and as share holders, the investors' returns are dependent on the growth and profitability of the business. The investment is unsecured, fully at risk (therefore it is also called as risk capital) and usually does not have defined repayment terms. It is this flexibility which makes private equity or venture capital an attractive and appropriate form of finance for early stage and knowledge-based projects in particular. 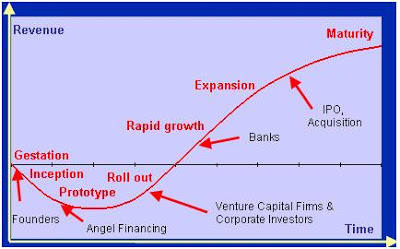 When we want to show where the venture capital is needed in a company life cycle the following figure will be very helpful. As it is seen from the figure, the company will be unable to generate revenue in the initial phase of its life. However, after a venture capital injection the company will grow very fast until it reaches its maturity. After showing the revenue generation and the timing of the need for the venture capital, the venture capital should be defined in more details in order to show what exactly the venture capital is. Available unless the investors can see a way to liquidate their investment in 5-7 years. · Does my company have high growth prospects and is my team ambitious to grow the company rapidly? · Does my company have a product or service with a competitive edge or unique selling point? · Can it be protected by Intellectual Property Rights? · Can I demonstrate relevant industry sector experience? · Does my team have the relevant skills to deliver the business plan fully? · Am I willing to sell some of the company's shares to a private equity investor? · Is there a realistic exit opportunity for all shareholders in order to realize their investment? · Am I prepared to accept that my exiting this business may be in the best interest of all shareholders? If the answers are 'yes', external equity is worth considering. If 'no', it may be that the proposal is not suitable for venture capitalists and it may take additional work on the company behalf to make the proposal 'investor ready'. · Whom will I contact at the business? · What is the summary of the business situation? · Who is the management team? · What are they selling? · How much money are they raising and how much will I invest? · Is there any security for my investment? · How will the money used? · What is the past financial performance? · What are the projections? · How will I cash out? · What makes it exciting? Finance Authority of Maine, A Primer On Venture Capital In Maine, Maine: 2008, p.2. Brian E. Hill, Dee Power, Inside Secrets to Venture Capital, US: John Wiley and Sons, 2001, p.1. David Gladstone, Laura Gladstone, Venture capital handbook: an entrepreneur's guide to raising venture capital, US: FT Press, 2002, p.1. Finance Authority of Maine, p.1. Irish Venture Capital Organization, A Guide To Venture Capital, Ireland, 2008, p.4.